Let dough stand at room temperature for 15 minutes. Meanwhile, grease twelve 2-1/2 inch muffin cups. On a lightly floured surface, roll dough into an approximate 16x12 inch rectangle. If you find the dough is difficult to roll, let it rest for a few more minutes, as necessary. Using a sharp knife or pizza cutter, cut into twelve 4-inch squares. Lightly press double squares into the prepared muffin cups, allowing edges to extend over rims of cups. In a small bowl combine pasta sauce and dried oregano. Spread some of the sauce mixture inside the dough-lined cups. Fill with mozzarella cheese and pepperoni*. Top with the remaining sauce mixture and sprinkle with Parmesan cheese. Bake for 25 to 30 minutes or until crusts are golden. Cool in muffin cups on a wire rack for 5 minutes, remove from muffin cups and serve. 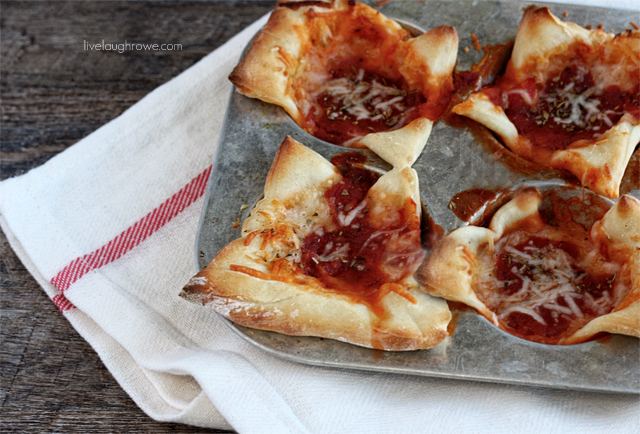 Adapted from Better Homes and Garden Pepperoni Pizza Cups.